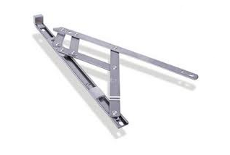 Standard side hung hinges, these are the type where the hinges restrict the size of the opening when fully open. Egress side hung hinges, these are fitted to newer pvc windows but can be fitted to older style pvc windows to give greater means of escape during a fire. They open at 90 Degrees to the window once fully open. 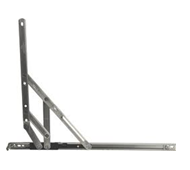 Top hung hinches operate similar to side hung hinges where they restrict the size of the opening when fully open. Tilt and turn bottom window hinges can be replaced if rusted or broken. If the top hinges is broken (the tilting operation) this can sometimes be replaced if the window tilts before it turns. In most cases the top hinge fails on older style windows which turn before they tilt. In this case the window will need a full new mechanism which R & R Remedials can supply and fit for you.